This training will be a 2.5 day comprehensive training for activists and organizers leading efforts to transform our political climate. 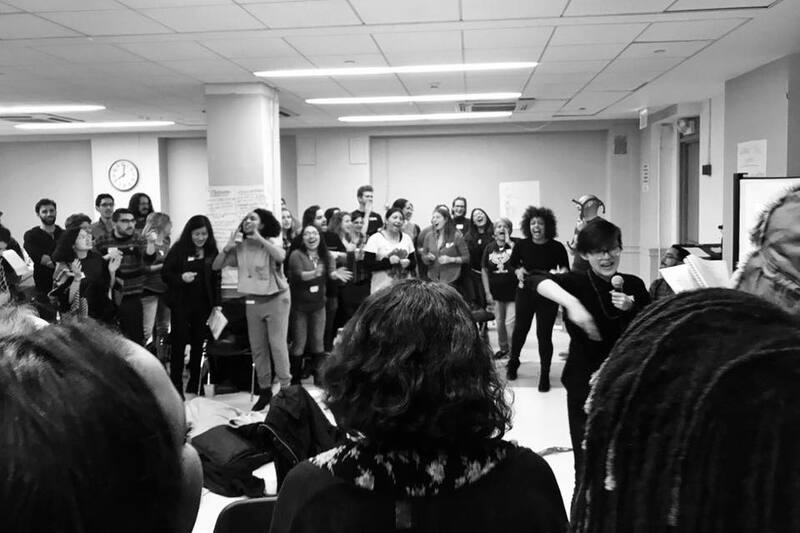 Our curriculum is designed to give organizers the tools to build progressive popular movements to win on the most pressing justice issues of our time, drawing on lessons and skills from contemporary and historic social movements. Applications are due May 10th. We'll get back to you shortly after applications close within a couple of weeks. Registration and confirmation will be expected within a week of acceptance. We are expecting that everyone who attends Momentum trainings will be present from the start until the end for each day, and will participate in all scheduled sessions. We will be starting the late afternoon of June 21 and will end late afternoon June 23. Please plan to be fully present at the training. If that is not possible for you, please consider joining us later at a better time for you. We will be selecting participants across experience, issues, and identities in order to create a diverse learning environment. Over the past year, we have seen interest and demand for the Momentum training increase dramatically. In order to create a learning space that supports our participants, our training will be limited to 25 participants, and we may not be able to accommodate everyone who wants to attend. If you have any questions, please contact team@momentumcommunity.org. Designing the DNA: story, strategy, and structure of powerful transformative social movements that win through the support of the public. How to grow your movement through cycles of action and absorption. Communicating your vision and goals in a way the public can understand. The difference between effective and counter-productive protests—how to claim the moral high ground and inspire mass support. Planning in advance to absorb people outraged by “trigger events” such as mass deportation raids, declaration of a Muslim registry, etc. Case studies from successful popular movements, including the Birmingham campaign, ACT UP, Indian independence movement, and others. The Momentum training is ideal for those who are able to influence strategy within their organizations as well as those who are willing to operate outside of existing organizations to launch new experiments. We strive to make our trainings as accessible as possible to those most directly impacted by injustice, including those from organizations with small budgets. With this in mind, we have a sliding tuition scale structure to meet these costs that accommodates organizations of various budget sizes. The actual cost per participant for the training, materials, and food is $500 per participant. If you are coming from an organization with resources, we ask that you pay for the full cost. Your support in covering the full cost allows us to dedicate more resources to travel scholarships and subsidized tuition for others. If your organization has resources or if you are willing to sponsor the costs for other participants, you may pay a sponsor-level tuition, and we appreciate your support. All additional tuition funds will go directly to scholarships and travel funds for participants to attend. We have structured a sliding scale tuition level for smaller organizations or for individuals coming without organizational support. We anticipate that most individuals and organizations will not be able to pay the full cost amount, and are committed to providing tuition discounts or scholarships to the majority of participants. If you have resources to cover the full cost or more, that helps us keep it accessible for other participants. If you are interested in applying for a scholarship, please indicate your interest on the application. If you have questions regarding the application process, please reach out to Cicia Lee, at cicia@momentumcommunity.org.